Buddhism is growing in Germany and as a result the number of Buddhist places of worship, meditation centres and religious centres where people meet are on the rapid increase. There are around 700 Buddhist institutions representing all traditions of Buddhism in Germany, these figures could be higher as some groups shun publicity. In the capital city, Berlin, there are around 30 – 40 Buddhist temples and over 50 German Buddhist organisations and a large Asian Buddhist community compromising of Sri Lankans, Thai Nationals, Tibetans and Vietnamese. 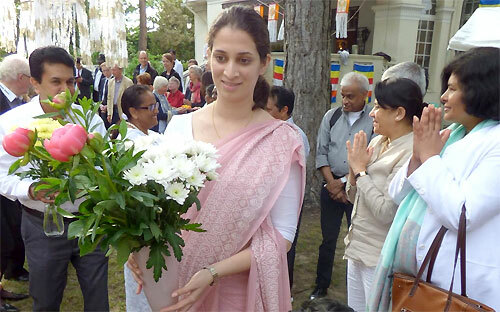 As for all Buddhists around the world for the Buddhists living in Berlin, the month of May is a busy month because of Vesak celebrations and it’s relevance to the Buddhist world. 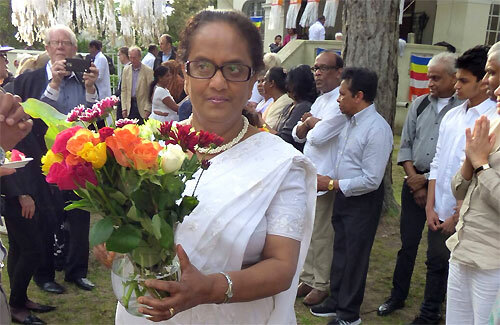 Since last year, Ambassador Karunatilake has added a novel event to the event calendar of the Sri Lanka embassy by holding a lecture on Buddhism in the month of May to coincide with Vesak celebrations in Berlin. The main intention of the Ambassador is to reach out to the German Buddhists in Berlin. He and his staff organized a ‘Vesak day’ programme on Friday 27th May 2016 at the Embassy premises, giving emphasis to the teachings of Lord Buddha. In order to provide an ambiance of Vesak to all present, the Embassy premises was decorated with Buddhist flags, clay lamps and colourful Vesak lanterns. The programme began with a ‘Gilanpasa Buddha Pooja’ followed by chanting of Seth Pirith by Ven. Dr. Wijayarajapura Seelawansa Thero, Ven. Rambukwelle Devananda Thero, Ven. Kongaspitiye Santharakkhitha Thero, Ven. Kurunegoda Dhammaloka Thero, Ven. Santuttho Thero of Germany,Ven. Bhikkuni Sangamittha of Netherlands and Ven. Bhikkuni Anagarika Kusaladhamma to invoke blessings upon the participants and all the Sri Lankans for a peaceful and a happy life. The sermon, “The silence in thunder - how to find peace and happiness in a chaotic world” was delivered by Ven. 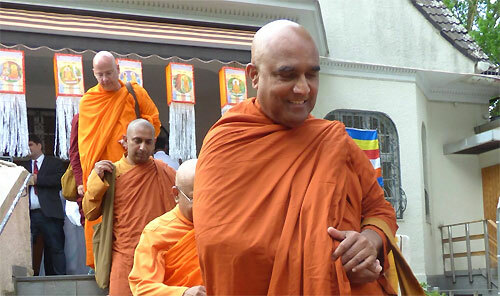 Dr. Wijayarajapura Seelawansa Thero, in German language and the participants were encouraged to reflect more deeply on the Buddhist way of life. Ambassador, Karunatilaka Amunugama in his short introductory speech emphasized the importance of Vesak and recalled the joint efforts of the international Buddhist community, led by Sri Lanka to spread the teachings of Buddha which conveys a timeless message for every individual to live happily and peacefully. Ambassador also mentioned the service rendered by German Buddhist monks and scholars to enrich and spread the teachings of Lord Buddha. At the end of the programme the participants were invited to enjoy a Sri Lankan vegetarian meal prepared by the Embassy staff. 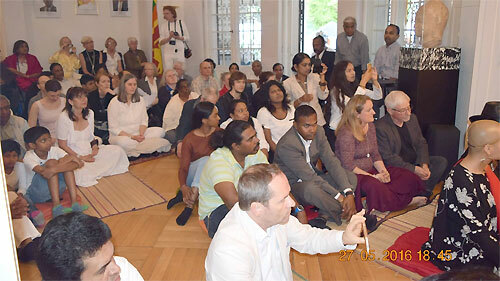 Berlin’s oldest Buddhist temple “das Buddhistische Haus” in Frohnau celebrated Vesak on the 22nd May with the Sri Lankan community and Germans. Around 200 Buddhists participated in religious activities on that day. Ven. Kongaspitiye Santharakkhitha Thero conducted the religious ceremonies at the Frohnau Temple. Thai and the Vietnamese commemorated Veask at their own temples. The majority of participants were mainly from their communities which makes around 8000 Buddhist followers in Berlin from Thailand and Vietnam. 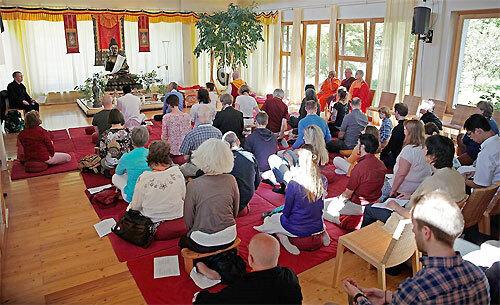 The consortium of 50 German Buddhist organisations from Berlin and Brandenburg called BUBB celebrate Vesak on the 8th of may at Lotus Vihara with a full day programme starting off at 10 in the morning with offerings, lectures, workshops and ending the day with variety programme in the evening.